The aim of the current study was to provide general practitioners with an overview of the available treatment options for Alzheimer's disease (AD). Since general practitioners provide the majority of medical care for AD patients, they should be well versed in treatment options that can improve function and slow the progression of symptoms. Biomedical literature related to acetylcholinesterase inhibitors (AChEIs) was surveyed. In the United States, there are four AChEIs approved for the treatment of AD: tacrine, donepezil, rivastigmine, and galantamine. There are other agents under investigation, but at present, AChEIs are the only approved drug category for AD treatment. AD is becoming a major public health concern and underdiagnosis is a significant problem (with only about half of AD patients being diagnosed and only half of those diagnosed actually being treated). Clinical trials have demonstrated that patients with AD who do not receive active treatment decline at more rapid rates than those who do. Given that untreated AD patients show decline in three major areas (cognition, behavior, and functional ability), if drug treatment is able to improve performance, maintain baseline performance over the long term, or allow for a slower rate of decline in performance, each of these outcomes should be viewed a treatment success. Alzheimer's disease (AD) is a progressive neurodegenerative disorder that is clinically characterized by loss of memory and progressive deficits in other cognitive domains. Alterations in behavior, such as apathy, agitation, and psychosis, are also cardinal clinical features. Together, the cognitive and behavioral alterations that define the clinical syndrome of AD underlie the progressive functional decline that all patients show in performing activities of daily living (ADL). Aside from its direct effects on patients, AD leads to a decreased quality of life and an increased burden on caregivers. AD is the most common cause of dementia in people 65 years and older: it affects 10% of people over the age of 65 and 50% of people over the age of 85 . The number of patients with AD is expected to rise with increasing life expectancy and growth in the aging population. AD will potentially be the most overwhelming public health problem of this century. In the United States alone, the projected prevalence is over 4 million and is expected to reach 14 million in the next 50 years . AD is one of several causes of dementia, accounting for approximately two thirds or more of all dementia cases . Vascular dementia (VaD) accounts for approximately 15% of all dementias , while some patients may also display dementia of mixed etiology (AD/VaD). A collaborative study of the incidence of dementia and major subtypes was conducted in Europe. The findings confirmed that AD is the most prevalent dementing disorder across all ages and with a higher incidence in women over 80 years of age . Since AD is the most common and best understood cause of dementia, it will be the focus of this review. A PubMed search was conducted with an emphasis on literature from the past 10 years. Underdiagnosis and undertreatment of AD are significant problems in the present clinical approach to the disorder. Approximately 50% of people with AD are actually diagnosed, and only 50% of those diagnosed are actually being treated ; 12% of patients diagnosed with AD are being prescribed acetylcholinesterase inhibitors (AChEIs), the established mainstay of treatment . The remainder of those treated are generally receiving psychotropic medications and other putative anti-dementia agents such as gingko biloba. Therapy for AD is initiated by general practitioners in more than 40% of cases, as they are the clinicians providing the majority of medical care for these patients . It has been increasingly recognized that early diagnosis and comprehensive management of cognitive and behavioral symptoms are crucial in optimizing disease management. Worthy and attainable goals of treatment include improvement in cognition and behavior or prolonged stabilization of function for as long as 1 year . Additionally, thoughtful care of the patient includes careful attention to the needs of the caregiver, who may be especially burdened by disease progression. AD progresses through several clinical stages (Figure 1). Loss of recent memory, or forgetfulness, is the most common presenting symptom. This is often accompanied, or shortly followed by, personality and behavioral changes, including disinterest in hobbies and social activities. 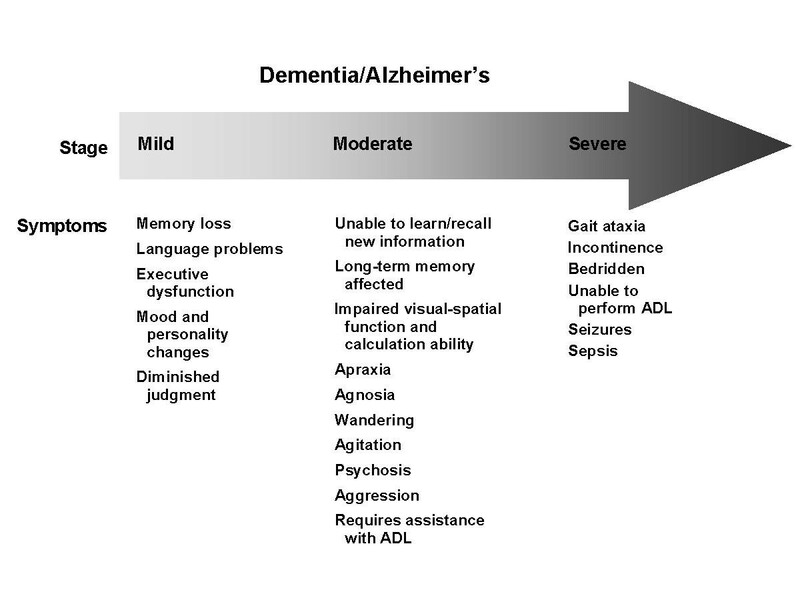 Complex tasks that involve executive functioning – such as the management of finances, using household appliances, and performing household chores – are often impaired early in the disease, whereas basic ADL – such as grooming and hygiene, toileting, and feeding – are not affected until the dementia is more advanced. Impaired patients will eventually develop decline in other cognitive realms. These include navigational ability (visual-spatial function), recognition of common items (gnosis), and motor programming (praxis) . AD progresses through distinct stages. Multiple risk factors have been proposed for the development of AD. It is generally agreed that advancing age and family history of dementia are the major risk factors in typical, late-onset AD . Genetic factors can also be a contributing risk in early-onset disease. While the role of apolipoprotein E (APOE) in AD pathology is unknown, there is a correlation between the risk of AD and APOE genotype . The APOE-4 allele has been most closely associated with increasing the risk of AD by three- to fourfold. AD is a complex neurologic disease that is diagnosed by clinical presentation; however, there are three consistent neuropathologic hallmarks of the disorder that are generally noted on postmortem brain examination: amyloid-rich senile plaques , neurofibrillary tangles , and neuronal degeneration. The primary cause of AD is still speculative, but AD pathology includes evidence of neuronal cell dysfunction either caused by or resulting in neurofibrillary tangles and/or β-amyloid plaques. In recent years, significant research attention has also been devoted to the roles of inflammation, free radical formation, and oxidative cell damage in the pathogenesis of AD. The progression of AD is related to the disease's effect on neuronal circuitry. Short-term memory loss, usually the first symptom of the disease, reflects a disruption of signaling between the hippocampus and entorhinal cortex, adjacent regions of the brain that are thought to be required for early establishment of memory . As AD advances in severity, neuronal signaling in the neocortical areas required for cognitive function and long-term memory storage are affected . AD exhibits a large impact on neurotransmission: the most prominent neurotransmitter changes are cholinergic. The effects of AD on the cholinergic system include reduced activity of choline acetyltransferase (ie, reduced synthesis of acetylcholine [ACh]) , reduced number of cholinergic neurons in late AD (particularly in the basal forebrain) , and selective loss of nicotinic receptor subtypes in the hippocampus and cortex . ACh is the major neurotransmitter affected in AD . Its pharmacology is a consequence of its interrelationship with acetylcholinesterase (AChE), butyrylcholinesterase (BuChE), muscarinic receptors, and nicotinic receptors. AChEIs are the only drug class currently approved in the United States for the treatment of AD. AChEIs block the esterase-mediated metabolism of ACh to choline and acetate and result in increased ACh in the synaptic cleft and increased availability of ACh for postsynaptic and presynaptic cholinergic receptors . There are four AChEIs currently available in the United States: tacrine (Cognex®, 1993), donepezil (Aricept®, 1996), rivastigmine (Exelon®, 2000), and galantamine (Reminyl®, 2001). Table 1 identifies prescription share and volume. Each of these agents has undergone extensive clinical trial evaluation throughout the world. Drug efficacy versus placebo has been demonstrated consistently in trials ranging in duration from 12 to 52 weeks. Generally, the majority of clinical trials conducted to establish the efficacy of treating AD with this class of agents have adopted similar outcome measures. The standard psychometric tool used to assess cognition in the majority of these studies is the Alzheimer's Disease Assessment Scale (ADAS) . The section of the scale from which scores are most frequently reported is the cognitive subscale (ADAS-cog). In addition to the ADAS-cog, the AD clinical trials also utilize quantified clinical impressions of the patient by a study investigator. These data usually are gleaned from direct examination of the study subject as well as from a caregiver interview. These clinical impressions are most often reported as a Clinical Global Impression (CGI) or Clinician Interview-Based Impression of Change (CIBIC). Source: IMS NPA Audit via SMART, 2002 (annualized). While the four available AChEIs are all members of a common drug class, they exhibit many individual differences. The characteristics of these agents are summarized in Table 2. AChE, acetylcholinesterase; BuChE, butyrylcholinesterase; ADL, activities of daily living. Tacrine was the first AChEI licensed for the treatment of AD. It is a centrally active aminoacridine and is a reversible cholinesterase inhibitor. It is currently used in the United States as a last-line agent because of a high incidence of hepatotoxicity, as evidenced by elevated serum transaminases. Additionally, the use of tacrine has been limited by its relatively short half-life that necessitates dosing at four times per day. Tacrine's efficacy was demonstrated conclusively in several large, multi-site clinical trials. Doses of at least 80 mg/day are required to achieve a modest degree of efficacy as measured by the ADAS-cog scale, activities of daily living scales, and clinical global impressions of change as assessed by clinicians and caregivers [16–18]. Donepezil is currently the most prescribed agent for AD, accounting for approximately 38% of prescriptions . It is a noncompetitive, reversible AChEI with a long half-life (approximately 70 hours), which allows for once-daily dosing of 5 or 10 mg . In multiple clinical trials, donepezil was well tolerated, with the majority of adverse events being mild, dose-related, and gastrointestinal in nature (Table 3) [21–23]. * Eisai Inc.: Aricept® (donepezil hydrochloride tablets) [package insert]. Teaneck, NJ 1998 †Occurring in at least 5% of patients and more often than in patients receiving placebo. The efficacy of donepezil in improving/maintaining cognition has been demonstrated in a 15-week and two 24-week clinical trials [21–23]. Doses of 5 mg and 10 mg showed significantly better results than placebo in measures of cognition (according to the AD Assessment Scale-cognitive subscale [ADAS-cog] ; Figure 2) and global function (according to the Clinician's Interview-Based Impression of Change-plus Caregiver Input [CIBIC-plus] ) [21–23]. 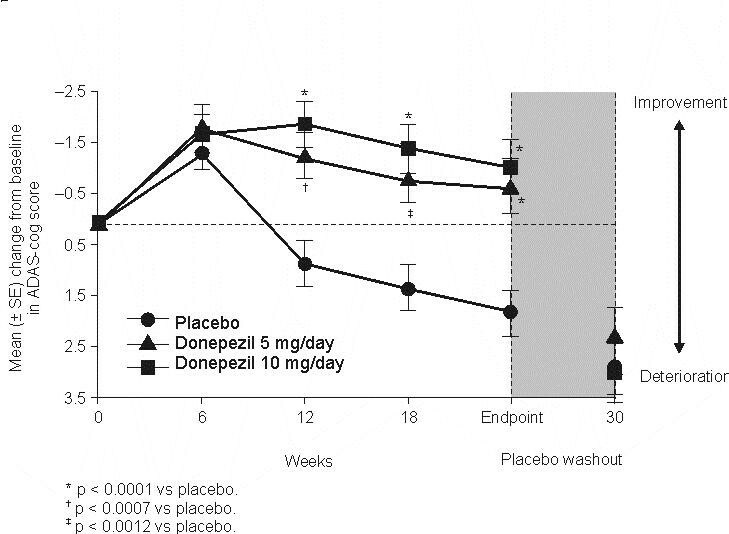 In another open-label study over a period of 254 weeks comparing donepezil to a historical placebo (estimated from annualized changes in ADAS-cog from historical cohorts of untreated AD patients), patients treated with donepezil 10 mg/day maintained cognitive function until Week 38 . Benefits in ability to perform ADL were also seen with donepezil 5 and 10 mg/day during clinical use [21, 22]. The long-term efficacy of donepezil has been examined in three recently published 1-year trials [27–29]. One study was a 1-year, placebo-controlled, function survival study (n = 431) . Donepezil extended the median time to clinically evident functional decline (specifically defined in the protocol) by 5 months compared with placebo. Treatment with donepezil for 1 year was associated with a 38% reduction in risk of functional decline versus placebo. In another 1-year, placebo-controlled study, patients (n = 286) with mild-to-moderate AD treated with donepezil showed benefits over placebo on global assessment, cognition, and ADL over 1 year . The third study provided 1-year data for donepezil comparing the rates of cognitive decline after 1 year in patients with probable AD treated with donepezil and those who remained untreated . Cognitive decline, based on change from baseline in Mini-Mental State Examination (MMSE) scores, was significantly slower in patients treated with donepezil compared with untreated patients (p = 0.007). It is important to note that the MMSE may not be the most accurate index of the rate of cognitive decline . As a result, while MMSE scores are often used as study entry criteria, the ADAS-cog is generally considered the gold standard by regulatory agencies for assessing the effects of treatment on cognition. The results from these three studies suggest that donepezil is beneficial over at least the first year of therapy; however, future studies are necessary to determine if these benefits extend beyond 1 year. A recent study investigating the effect of donepezil treatment on caregiver burden used a survey of AD caregivers of patients treated with donepezil matched to AD caregivers of patients not treated with donepezil . In the survey, time demands and distress linked to caregiving tasks were rated. While caregivers of patients treated with donepezil reported significantly less difficulties with caregiving, no differences in time demands were noted . The third AChEI to be approved for use by the FDA, rivastigmine, is prescribed in approximately 20% of all AD cases . Similar to tacrine , rivastigmine is a noncompetitive, reversible AChEI as well as an inhibitor of BuChE (effects of inhibiting this enzyme on central nervous system cholinergic function are unknown) . The drug has a shorter half-life than that of donepezil, so it must be administered twice daily. Effective doses range from 6 to 12 mg/day. Gastrointestinal adverse events are generally most common (Table 4), including weight loss ; slow dose escalation and administration after meals usually improve tolerability . * Novartis Pharmaceuticals Corp.: Exelon® (rivastigmine tartrate) capsules [prescribing information]. East Hanover, NJ 2001. † Occurring in at least 5% of patients and at twice the placebo rate. In two similarly designed double-blind, placebo-controlled, 26-week trials, treatment with rivastigmine 1 to 4 mg/day or 6 to 12 mg/day was studied for its effects on cognition, global function, and ability to perform ADL [33, 35]. Patients in the high-dose group in each study showed significant benefits over placebo in cognition (measured by ADAS-cog; Figure 3), global function, and ability to perform ADL. 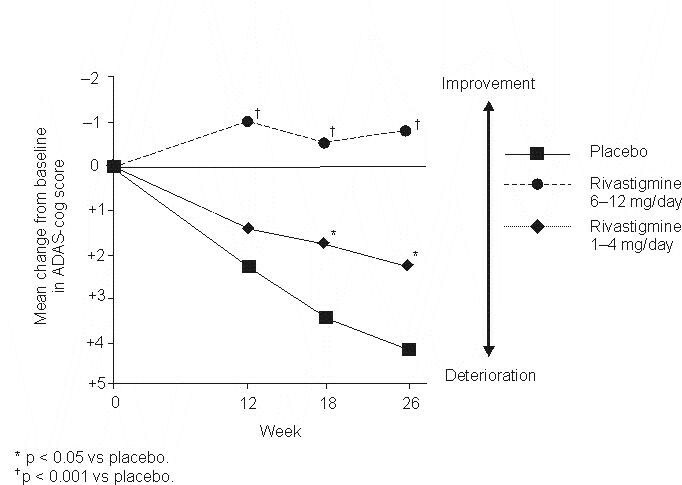 In an open-label extension of the earlier study , patients originally in the higher-dose group maintained cognitive function above baseline until Week 38; after that point, function declined but remained above that of the patients in the lower-dose or placebo groups . Approved by the FDA in February 2001, galantamine is the newest AChEI to be introduced. It is a novel drug with a dual mechanism of action: competitive inhibition of AChE and allosteric modulation of nicotinic receptors (Figure 4) [14, 37]. While the clinical significance of nicotinic modulation for the treatment of AD may not be fully elucidated, it is clear that nicotinic receptors play a role in cognition. Presynaptic nicotinic receptors control the release of neurotransmitters that are important for memory and mood (eg, ACh, glutamate, serotonin, norepinephrine) . It has been shown that blocking nicotinic receptors impairs cognition , and selective interaction with nicotinic receptor subtypes improves cognitive function and memory [39, 40]. Galantamine proposed mechanisms of action: acetylcholinesterase inhibition and allosteric nicotinic modulation [14, 37]. Early evidence supports the nicotinic potentiating activity of galantamine, in addition to its cholinesterase-inhibitory properties [37, 41]. 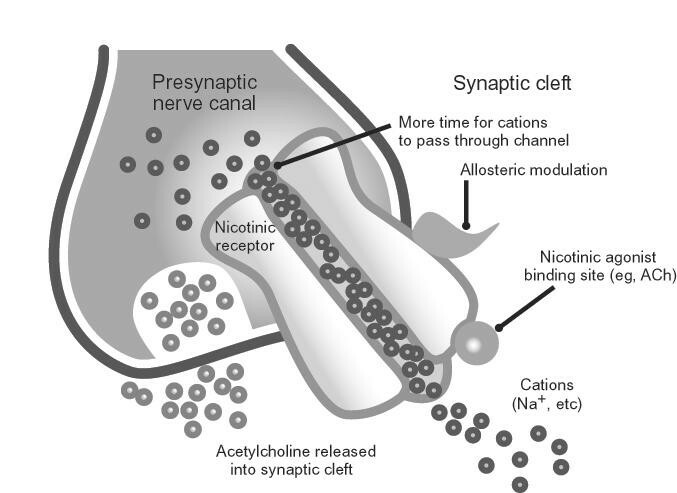 The dual mechanism of action of galantamine results in increased levels of ACh in the synaptic cleft and increased effect at the nicotinic receptors [14, 37]. Increasing attention is being directed to determine whether nicotinic modulation confers neuroprotection . Galantamine has been shown to be efficacious in patients with previous exposure to other AchEIs . Galantamine has a relatively short half-life, so doses are given twice daily. Recommended dosing is 16 mg/day, with a maximum recommended dose of 24 mg/day [43–45]. Adverse events associated with therapy are similar to those seen with other AChEIs; the majority are gastrointestinal in nature (Table 5) . Unlike donepezil, which has been associated with an elevated incidence of insomnia and an increased use of hypnotic medications , galantamine does not appear to be linked to sleep problems [48–50]. * Occurring in at least 5% of patients and more often than in patients receiving placebo. In multiple double-blind, placebo-controlled studies, galantamine has shown promising effects on cognition, global function, behavior, and ability to perform ADL [45, 46, 51]. Patients treated with galantamine 24 mg/day for 6 months showed significant improvements in cognition versus placebo and in comparison to baseline (Figure 5); global functioning either improved or remained stable, and ability to perform ADL did not change significantly from baseline . 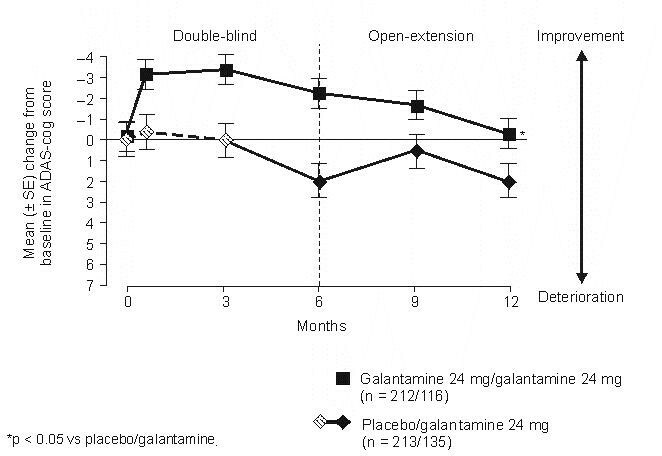 In a 6-month, open-label extension, patients receiving galantamine 24 mg/day for the entire 12 months maintained cognitive ability (Figure 5) and ability to perform ADL at baseline levels . Patients who had received placebo for the first 6 months and then switched to galantamine never achieved the level of function seen in patients treated with galantamine throughout, emphasizing the importance of early treatment to maximize benefit . In a 24-month, open-label extension of two double-blind, placebo-controlled trials, patients taking galantamine for the entire 36-month period continued to show cognitive benefits at 36 months when compared with the expected decline of a historical placebo group . Thus, it appears that galantamine 24 mg/day provides cognitive benefits in patients who continue treatment compared with the expected natural course of cognitive decline for up to 36 months. In a 5-month, double-blind, placebo-controlled trial, a slower dose-escalation schedule was used in an attempt to improve tolerability . Patients treated with galantamine 16 or 24 mg/day showed significant improvements in cognition over baseline and compared with placebo. These same doses produced significant improvements over placebo in ability to perform ADL (according to the AD Cooperative Study Activities of Daily Living inventory [ADCS/ADL], an assessment developed to measure the daily activities of patients with AD ) and in behavioral symptoms (according to the Neuropsychiatric Inventory [NPI], which assesses the frequency and severity of symptoms in 10 behavioral domains ) . Treatment with galantamine has also been shown to ease caregiver burden . Caregiver burden is defined as the amount of time patients require supervision and assistance with ADL. When caregiver time was measured with a questionnaire documenting time spent supervising and assisting with ADL, untreated patients required increased supervision by the caregiver and increased assistance with ADL over time, whereas patients treated with galantamine for 6 months showed no significant change in time spent by the caregiver on supervision. Caregiver assistance with ADL decreased 61 minutes each day. At present, there exist no clearly established guidelines for determining which specific AChEI to use for which specific patient with AD. Existing clinical trials data do not help to inform this clinical decision making. By and large, the magnitude of the treatment effect observed in the published, placebo-controlled clinical trials for all of the available agents is comparable. The side-effect profiles differ in that rivastigmine, as an example, likely has more gastrointestinal-related adverse events in therapeutic doses than donepezil or galantamine. Donepezil appears to have somewhat more sleep disturbance reported as a side effect than the others. However, for reasons that are still unclear, clinical experience dictates that some patients will be idiosyncratically more tolerant of one agent than another, or perhaps more responsive to one agent versus another. With multiple therapies having become available in the past few years for treatment of AD-related symptoms, this may prompt switches among AChEIs. Reasons for switching among different AChEIs may include one or more of the following: dosing convenience, inefficacy or perceived inefficacy, poor tolerability, physician preference, patient or caregiver request, or economic considerations. Before a switch is made, the physician must consider the pharmacodynamics and pharmacokinetics of the possible options to maximize patient tolerability and minimize loss of established efficacy from the previous regimen. A drug with a longer elimination half-life, such as donepezil, may require a washout period of 1 to 2 weeks before initiating another AChEI to avoid cholinergic toxicity . However, one must also consider that significant functional decline may occur during washout, and significant improvements achieved during therapy may be lost during washout. If the latter occurs, restoring function to pre-washout levels is rare if the drug is reinstated . Three studies were done to determine the minimum washout period necessary when switching from donepezil to rivastigmine (1.5 mg twice daily) . The first study compared a 2-week washout (n = 5) versus no washout (n = 6) of donepezil before rivastigmine was started. In the second study, patients (n = 105) went through a 4-day donepezil dose reduction, followed by a 4-day washout before initiation of rivastigmine at 1.5 mg daily, and then escalated based on tolerability. The third study compared donepezil washout periods of zero days (n = 57), 3 days (n = 2), and 4 weeks (n = 3). The results of these three studies suggest that long washout periods may not be necessary when switching from donepezil to rivastigmine . Larger studies are needed for verification of these findings. A post hoc analysis of a previously conducted trial  was performed to examine the effect of prior AChEI exposure on the efficacy and tolerability of galantamine . There was a minimum 2-month washout period between previous AChEI therapy and initiation of galantamine. Regardless of previous AChEI exposure, treatment effects were consistent with galantamine, with patients experiencing significant improvements in cognitive and global function. There were no significant differences between subgroups in terms of adverse events, indicating that galantamine is well tolerated despite prior AChEI use . When determining the length of necessary washout, the physician must weigh the risk for cognitive decline during the washout period against the potential for adverse events without a washout on a patient-by-patient basis . It is important to consider individual patient factors, such as current cognitive abilities, health and frailty, use of concomitant medications, potential for drug interactions, and previous sensitivity to AChEI treatment . When switching among AChEIs, the goal is to maintain cognitive function while avoiding the emergence of adverse events that may cause patients to discontinue therapy . Vitamin E is an antioxidant that prevents cell damage by inhibiting the oxidation of lipids and the formation of free radicals. There is only one clinical trial investigating its use in patients with AD . Though it was safe and well tolerated, there were no improvements in cognition, function, or behavior. However, patients taking vitamin E did show a significant treatment effect, specifically in the delay of institutionalization . The American Psychiatric Association recommends the use of 1,000 IU of vitamin E twice daily for patients with moderate AD. Additional trials are needed to test the benefits of vitamin E in patients with milder forms of AD. Other alternative treatment agents that may have beneficial effects in patients with AD are selegiline, ginkgo biloba, and nonsteroidal anti-inflammatory drugs. Unfortunately, within the nonsteroidal anti-inflammatory class, recently concluded clinical trials of two selective COX-2 inhibitors, refecoxib and celecoxib, failed to show benefit as therapeutic agents. However, based largely on epidemiologic evidence, significant attention is still being directed to whether nonselective agents such as indomethacin, sulindac, and ibuprofen may have a role in the prevention and treatment of AD. Recently, the statin class of compounds as well as agents that lower serum homocysteine levels (eg, folic acid) have been proposed for their possible therapeutic roles in the treatment of AD. More studies need to be conducted before recommendations can be made as to their appropriate use in the AD population. As the condition of patients with AD progressively deteriorates, they often develop behavioral symptoms that can be very troublesome to the caregiver and/or family. Common psychiatric and behavioral symptoms frequently seen include apathy, agitation, mood lability, blunted affect, disinhibition, withdrawal, delusions, anxiety, suspiciousness, dysphoria, hostility, aggression, and hallucinations [59, 60]. As severity increases, these symptoms can increase caregiver distress and often lead to placement of the patient in a personal care facility . Before treatment of these symptoms is begun, the physician must rule out any medical disorders, physical discomfort, medication effects, or pre-existing psychiatric illness that may be contributing factors. Once target behaviors are identified, appropriate treatment (pharmacologic and/or environmental) can be initiated. While no agents are currently approved for the treatment of behavioral symptoms in patients with AD, physicians commonly prescribe off-label agents to help manage these symptoms. Agents of choice include the atypical antipsychotics (eg, risperidone, olanzapine, quetiapine), serotonergic compounds (eg, citalopram, sertraline), or mood stabilizers, such as sodium valproate. The best clinical trial data gathered to date support the superior efficacy over placebo of risperidone  and olanzapine  for psychosis and agitation in dementia. Emerging placebo-controlled data also support a role for sodium valproate  in the treatment of agitation. Importantly, the potential psychotropic effects of ChEIs have also been increasingly explored. The cholinergic hypothesis of the 1980s linked the changes in memory and cognition seen in AD with biochemical changes in the brain, changes that included deficits in acetylcholine, norepinephrine, and serotonin. Treatment for AD involved cholinomimetic therapies that block the degradation of acetylcholine available at the synapse. AChEIs were developed to delay the progression of cognitive decline. The deficit in ACh is responsible for some of the neuropsychiatric symptoms presented in AD – agitation, psychosis, personality changes, depression – because emotional behaviors are mediated by the effects of cholinergic action on the frontal and temporal lobes of the brain. AChEIs may create a more favorable neurochemical environment allowing psychotropic agents to be more effective . Clinical trials examining the psychotropic effects of these cholinomimetic drugs are being conducted [16, 65–69]. The positive effects that galantamine exhibits on the behavioral aspects of AD illustrates multiple mechanisms by which this class of agents may exert psychotropic effects. One such mechanism is the action to increase ACh: since patients with AD have low levels of ACh in the limbic system , enhancing these levels with an AChEI may help to improve behavioral symptoms. With galantamine specifically, its nicotinic-modulatory property may allow for increased arousal and decreased aberrant motor behavior and agitation similar to the mechanism by which psychostimulants act in the treatment of attention deficit disorders in children . In addition, improved function of nicotinic thalamofrontal projections by galantamine may reduce agitation, which appears to be frontally mediated . There are several new agents in development with various mechanisms of action for the treatment of AD. The identification of new targets for AD treatment may allow for combination therapy in the near future. While AChEIs are the only approved treatment option for patients with AD, researchers are currently studying other therapies. Memantine (Merz & Co., Frankfurt/Main, Germany) is a noncompetitive, N-methyl D-aspartate (NMDA) receptor antagonist approved in Germany for more than 10 years for the treatment of dementia. The proposed mechanism by which memantine exerts its effects on dementia is thought to be related to its neuroprotective characteristics [73, 74]. Clinical safety and efficacy have been investigated both in clinical trials and postmarketing surveillance studies [75–77]. Memantine is generally well tolerated, with the most common adverse events being vertigo, restlessness, hyperexcitation, and fatigue . It may become a neuroprotective treatment for dementias in the near future, and it may also be combined with AChEIs for symptomatic relief of AD . An additional option for treatment of AD that has received much attention is immunization against β-amyloid to reduce the levels of β-amyloid plaques ; studies are still in early development for its applicability to AD treatment. Unfortunately, an ongoing clinical trial of one such vaccine was recently halted due to the emergence of neuroinflammation in treated subjects. Other treatment possibilities include γ – and β-secretase inhibitors to prevent β-amyloid formation . AD is a progressive disease that affects the patient's cognition, behavior, and function. Losses associated with the disease have a profound impact on the patient and caregiver. Coping with this spectrum of change places an enormous burden on family caregivers of patients with AD. Diagnosis of the disease is the first important step, since approximately 50% of patients with AD are not diagnosed, and only 50% of those diagnosed are being treated with some type of therapy . Although there is no cure for AD, it is a treatable disease. While treatment success was traditionally defined as improvement from baseline function, given that untreated patients with AD show declines in cognition, ability to perform ADL, and behavior, if drug treatment is able to improve function, maintain baseline function over the long term, or allow for a slower rate of functional decline, each of these outcomes should be viewed as a treatment success. The cognitive and functional benefits achieved with treatment lead to improvement in caregiver burden, a parameter that is very important but often overlooked. While there is much ongoing research in the area of AD treatment, there are currently four AChEIs available in the United States: tacrine, donepezil, rivastigmine, and galantamine. Although they are all members of the same drug class, they have differences in their actions, dosing schedules, and side-effect profiles. Results obtained with the use of AChEIs clearly fit the updated definition of effective treatment by improving or maintaining all domains of AD (cognition, ADL, and behavior) in the short term, and by slowing the decline in these functions through 12 months of use or longer. It is important that physicians fully understand and clearly communicate to both the patient and caregiver the expected outcomes of treatment on the disease process. Although prescribing atypical antipsychotics and other agents for the management of behavioral symptoms associated with AD is not an FDA-approved practice, this type of therapy can significantly decrease the severity of these symptoms and may ease caregiver burden and postpone institutionalization . Early diagnosis and comprehensive treatment are crucial in optimizing disease management. The most successful treatment outcomes result from a firmly established partnership that encourages active communication between the patient's caregiver and physician. AChEIs represent the mainstay of the pharmacologic therapy of AD, yet the effects are largely symptomatic and may not prevent disease progression. The beneficial effects that we do encounter though modest are meaningful to many patients and their families. We anticipate a future in which the practicing clinician will prescribe agents that will not only slow the clinical progression of the disease, but also restore cognitive and behavioral functioning of the patient to premorbid levels, or best, prevent the development of AD in susceptible persons. Potential targets for these evolving therapeutics will likely include inflammation, neuroprotection, amyloid deposition, neurofibrillary tangle formation, and other important aspects of the pathogenesis of AD. William Reichman, MD receives grant and/or research support from Organon Inc. He is also a consultant and a member of the speakers bureaus for Janssen Pharmaceutica Products, L.P., Pfizer Inc., Eli Lilly and Company, Abbott Laboratories, and AstraZeneca Pharmaceuticals. The author has given final approval of the submitted manuscript. The author has participated in the analysis and interpretation of data covering the whole content of this paper and has conducted critical revision of the manuscript for important intellectual content.